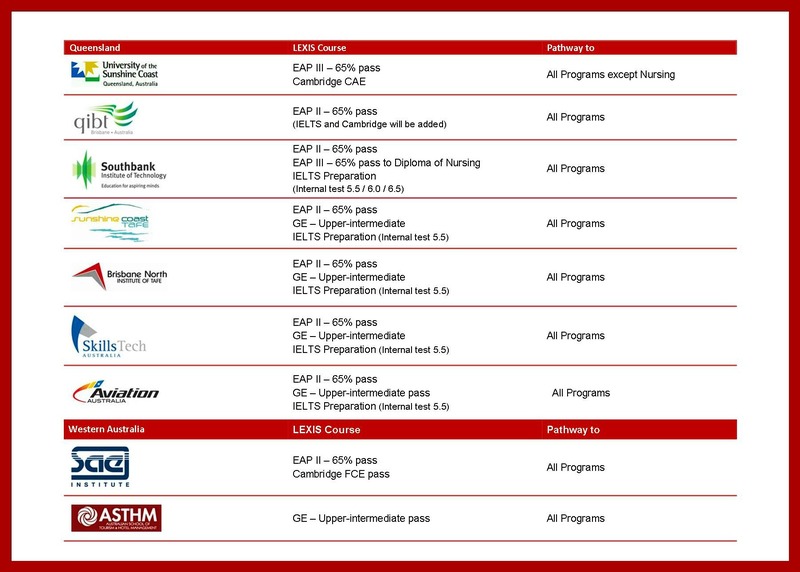 Lexis English is pleased to announce new pathway links with the following Institutions! Take a look at our latest pathway opportunities towards further education! Lexis English is the first school to offer pathway agreements towards a Diploma of Nursing at SBIT, which has IELTS 6.5 as the entry requirement. For those of you who are interested in studying at Lexis Brisbane, we will be opening an EAP course starting on 10th September 2012.
Who says learning can’t be fun! There was some serious gaming going on at Lexis Noosa! 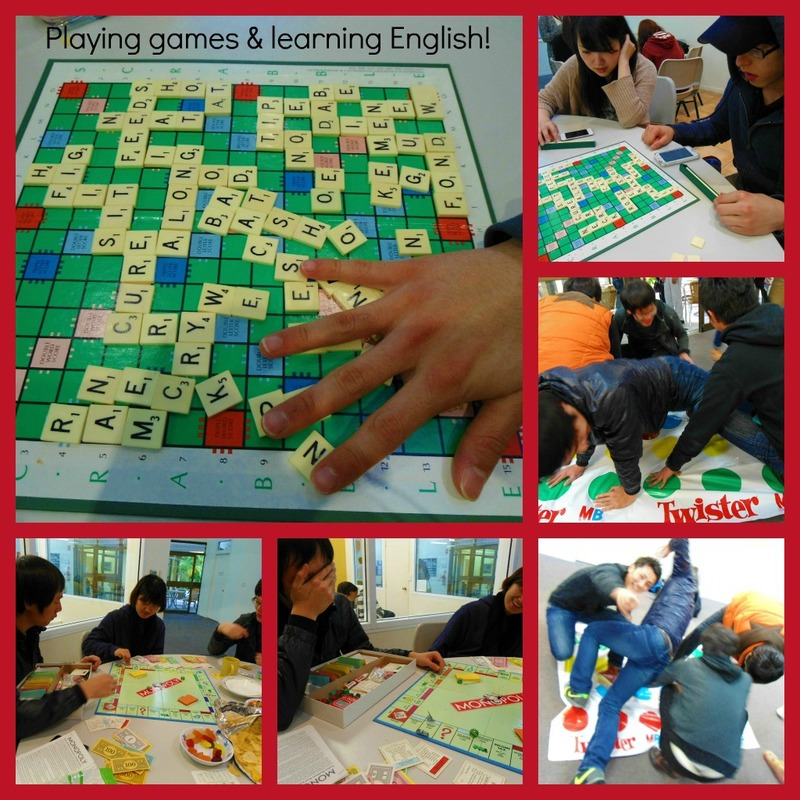 Students improved their English skills while playing popular games – Scrabble, Monopoly and Twister! There were even sweets and snacks provided to help increase brain power. Lots of fun was had by all, with students even playing against teacher, Zoe! Zoe did win the Scrabble game in the end, but only by a few points – well done Sunami and M.K! Lexis Noosa students get Artistic! There were about 12 students who took a painting class with Lexis Noosa teacher Phil, who is also a watercolour artist. 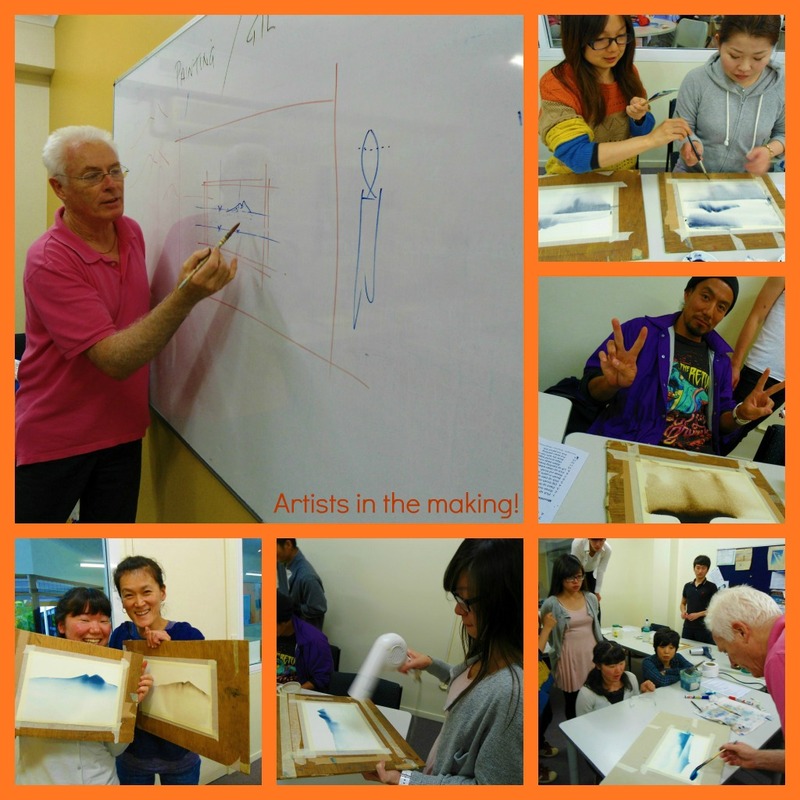 Phil showed the students some special watercolour techniques and they all produced beautiful pieces of art, as shown in the photos.The students thoroughly enjoyed the workshop and we can’t wait to see what they create next time! We have 10 new students starting this week, including Felix the TAP & Surfing Student! There is a great Nationality mix with students from Switzerland, France, Korea, Ukraine, Brazil and Austria! 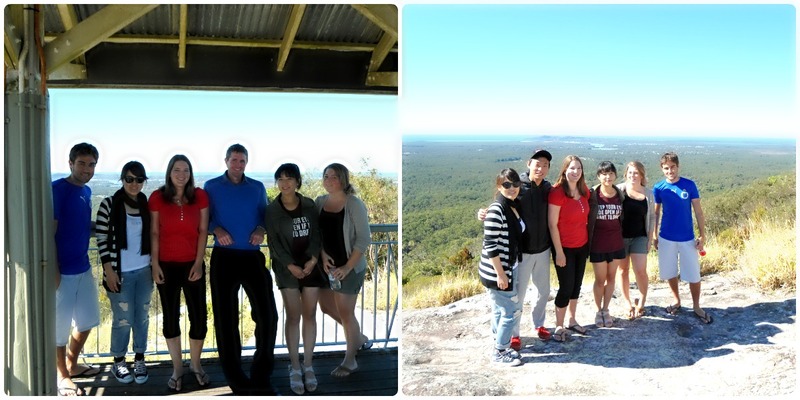 After completing the final exam for Upper Intermediate, the following students – Petra, Linda Frederico, Yoko, Elli and Jason went for bush walk up Mt Timbeerwah to get a better view of Noosa’s beautiful scenery. This was a great opportunity for students to practice their English outside the classroom. Lexis Noosa students wore their poker face for today’s activity as they played to win a carton of beer to share with their friends. It was an hour of intense reading of cards and faces. 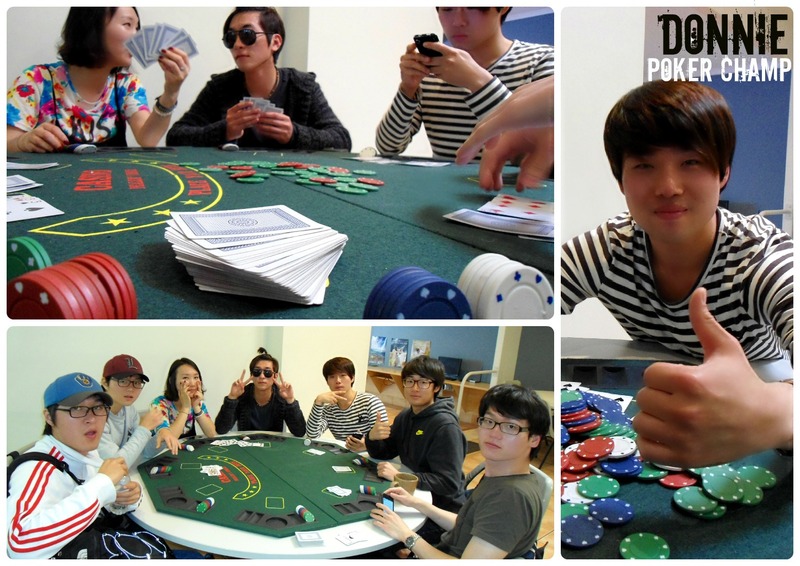 Some students were definitely in it to win it whilst others were happy to have a go and learn the art of poker playing. Even though Donnie spent half the time texting on his phone rather than strategising, he still managed to win the tournament! 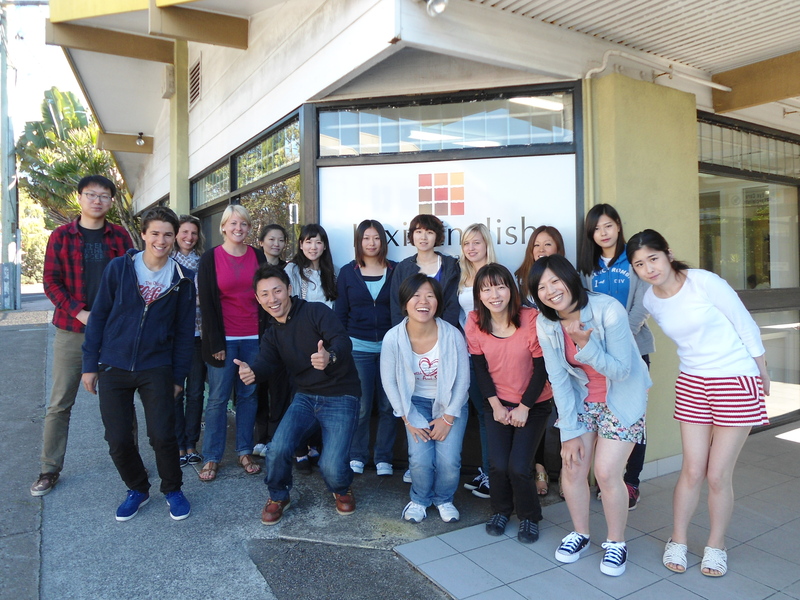 Welcome to our 19 new students from Brazil, Japan, Korea, Switzerland, Italy, France and Taiwan. 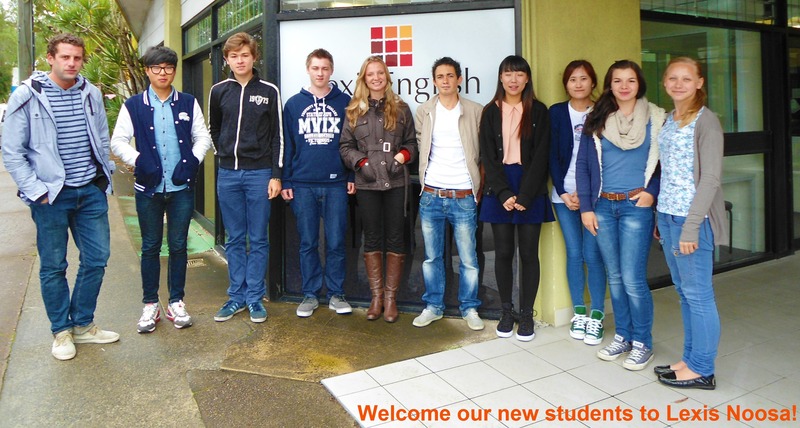 They are here to study General English, Cambridge FCE and IELTS. Included is Eliott from France who is doing the Teenage Activity Programme with Surfing. 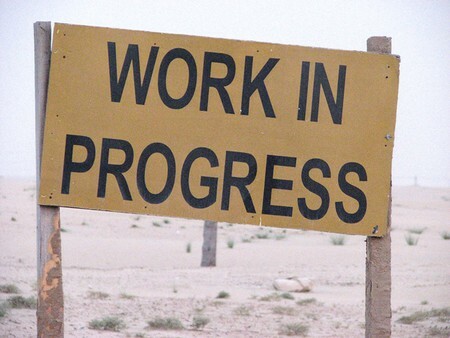 Lexis Job Workshop – Works! Honami makes a great coffee, go say ‘Hi’ & try one with your Lexis Advantage card! “My name is Honami & I am from Sapporo, Japan. I am studying general English full time for 3 months & after starting in an elementary class, I have moved up to a pre-intermediate class. My Teachers are very nice & make my lessons fun and interesting. I am now working & found the Lexis job workshop was very valuable for me. My Teacher helped me find the confidence I needed to get my job & was also the person who got me the interview. I am working at the coffee & fruit shop right near the school. My work hours are flexible but I mostly work in the morning before school & also after school. I work Monday to Friday & like it because my weekends are still free. 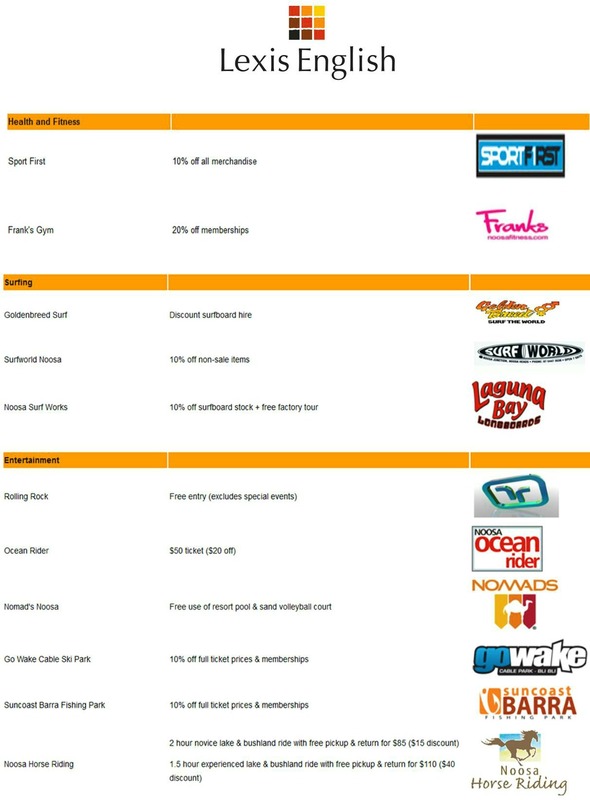 Lexis Students…do you want to be fit and have fun this winter? Keep fit this winter by taking advantage of your Lexis English student discount card! FAREWELL CAMBRIDGE STUDENTS & GOOD LUCK! It was the last day of school for our latest Cambridge classes and what better way to celebrate than student night at KBs Noosa! It has been their local party venue for the last 3 months and last night it was time to say their final goodbye. 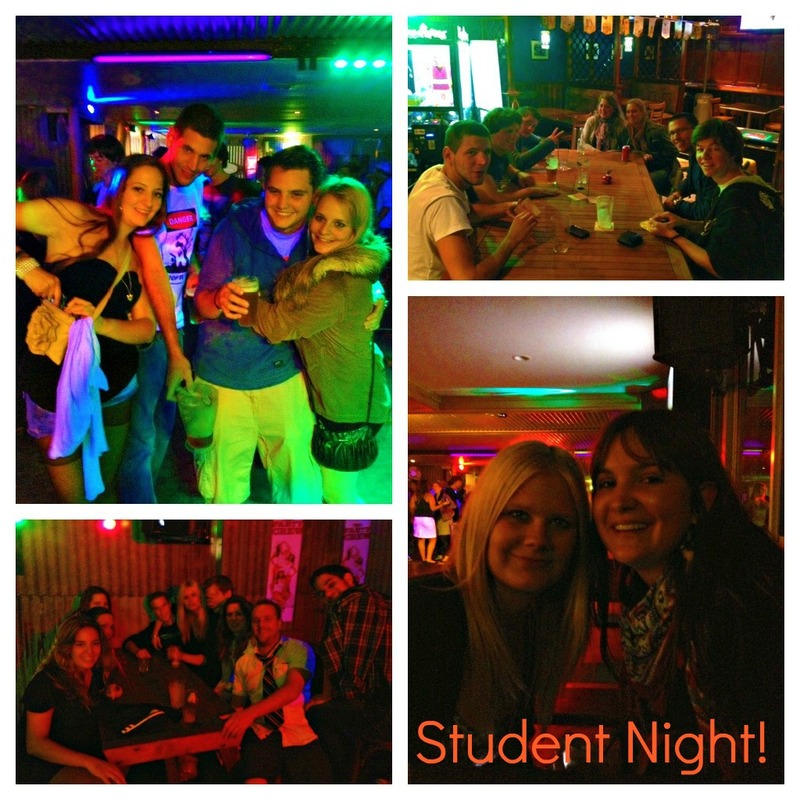 Student night will be very quiet without you guys… you certainly know how to party hard! Enjoy your time travelling around Australia and think of us next Thursday when you are partying in another town. Season Restaurant Noosa is a vibrant, fast paced beachfront restaurant operating 7 days a week for breakfast, lunch and dinner. 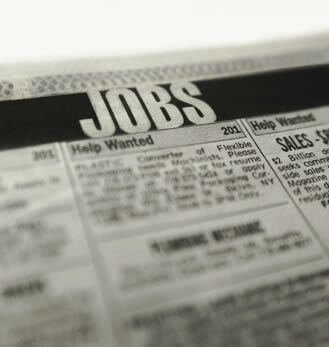 We are seeking an experienced and reliable casual kitchen hand. You will need to be a team player, efficient and organised. Situated along the beautiful Noosa River, Sirocco Noosa offers food influenced by North Africa and the Mediterranean in a casual, friendly environment. Currently, we are seeking a food and beverage enthusiast, with a la carte experience to join our team. I need a female for after school 2 days a week and over the occasional weekend for small simple ironing, vacuuming and just hanging with the kids along with some odd jobs here and there. They will need to make their own way here to Peregian on the bus and home. I have a spare room if it’s a late night for me and they have to sleep over. Really? 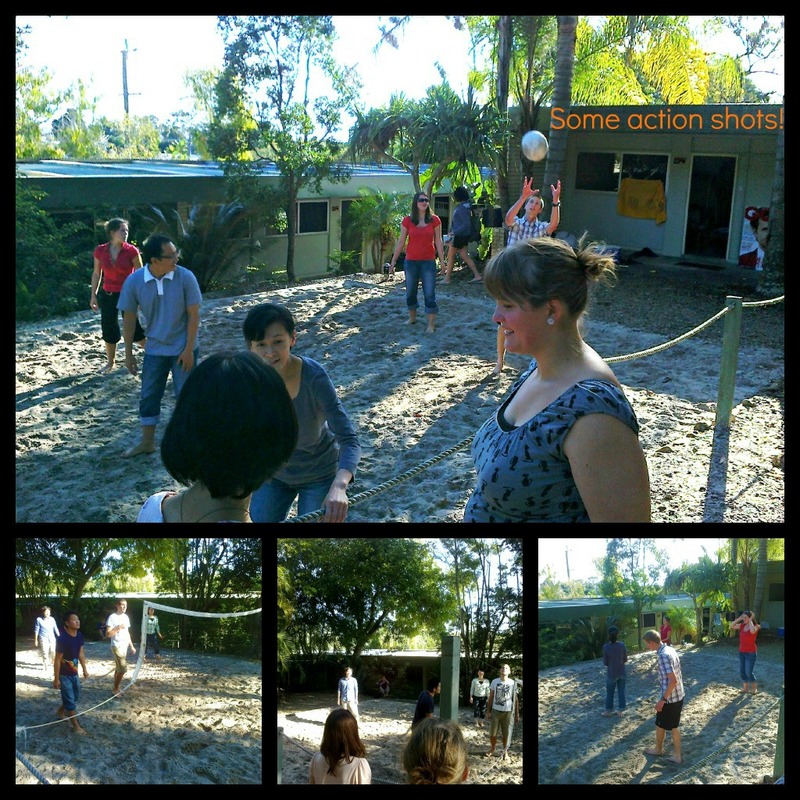 Kangaroos, Koalas and Possums playing volleyball…. All played for the $20.00 bar tab prize from the Camel Bar – nice one Nomads! The Possums were the winners and I’m sure they’ll be grinners, as they enjoy their prize at tonight’s Student Night! Congratulations to our Table Tennis Champs! 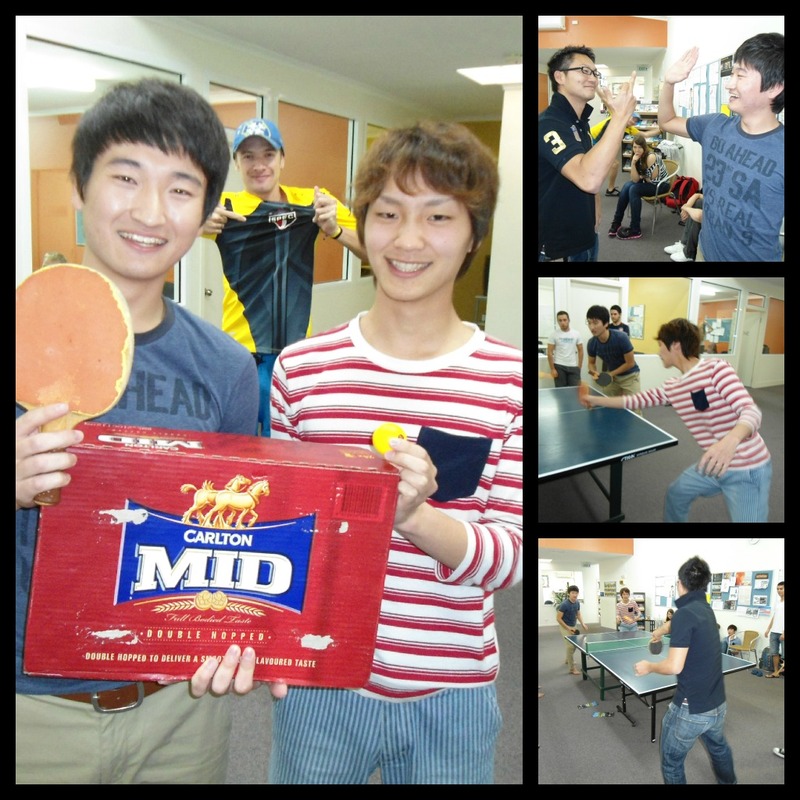 Monday’s activity was a Table Tennis Championship. Ten teams fiercely competed for the grand prize of a carton of beer. There were some intense moments during the competition as there are some very skilled table tennis players at Lexis English! In the end Jason and Yuto were the grand champions and left the school two happy sportsmen. Congratulations! Don’t drink it all at once! 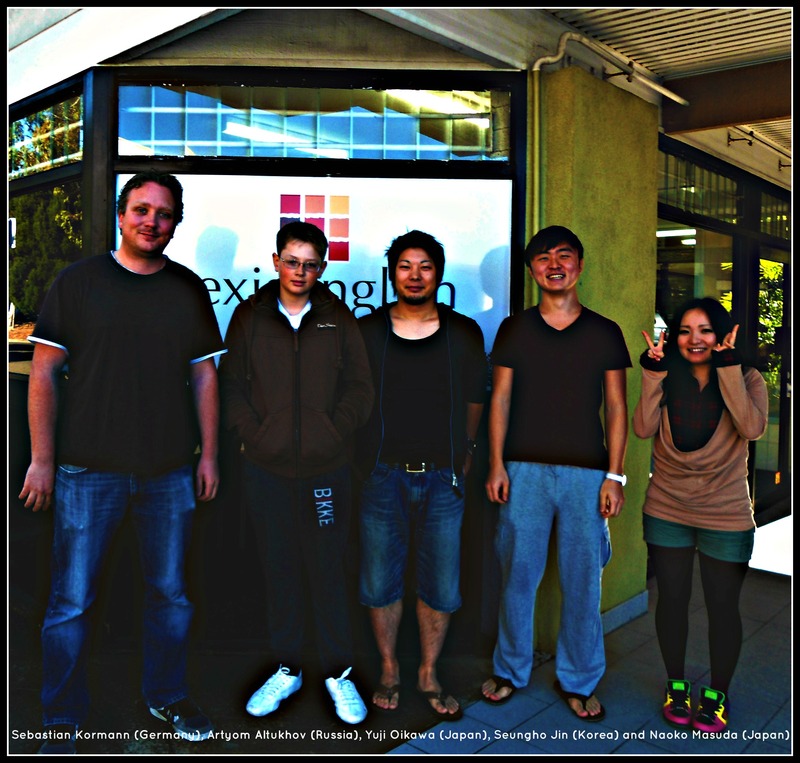 Sebastian Kormann (Germany), Artyom Altukhov (Russia), Yuji Oikawa (Japan), Seungho Jin (Korea) and Naoko Masuda (Japan).